Hi! I've been drawing faces again. I keep losing count how many faces I have done this year. Not a whole lot I think. The name Cecilia stuck when I look at this one. 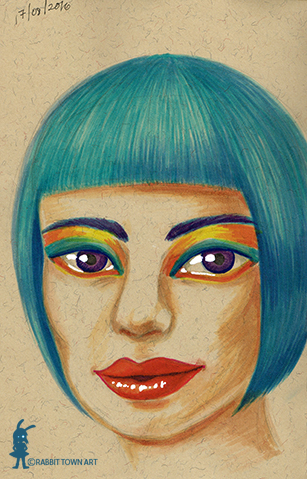 I have another unfinished face doodle in my book too that I need to go and finish, I think! Faces are really fun. . Been veering off and changing my coloring now and going in a more colorful and unrealistic direction. Today...I just worked on my kookyrabbit entry for tomorrow, followed up work, more social media, started a new painting (not turning out the way I want though) and I think am going to finish my unfinished face doodle now. Seeing a Myotheraphist for my shoulders tomorrow. A massage is what I need. Gotta look after these drawing muscles!